The 1930s and 40s in Germany are remembered as a particularly dark time for humanity, as millions of lives- Jews, the mentally retarded, and other so-called undesirables- were lost to the twisted ethos of National Socialism. 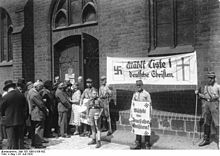 One aspect that is difficult to understand today is the way that many common citizens, including the German Evangelical Church, were complicit in the Nazis’ rise- from pledging allegiance to Hitler to adopting the Aryan Paragraph and the Nuremberg Laws. Today we are posting the conclusion to a series of articles considering five mistakes made by the German Christians in the years leading up to World War II. I have selected willful blindness, caused by timidity, as the number one mistake of the German Church because it is what led to the other problems: because they were not willing to boldly face the truth of what the Nazis were doing, and the truth of what the Bible commanded, they diluted their theology. They forsook their knowledge about what is right and conformed to what society was doing. Jesus demands much of his followers; more than moral lives, more than regular church attendance, and more than sound theology. He demands obedience, and lives devoted to him. To try to remain separate from the world ignores the example of Jesus, who left his heavenly throne to walk with sinners and tax collectors.